Countries will have to be far more ambitious in cutting greenhouse gas emissions if the world is to effectively curb a rise in global temperature at 2 degrees C or less. This is the conclusion of a new greenhouse gas modeling study, based on the estimates of researchers at nine leading centres, compiled by the UN Environment Programme (UNEP). 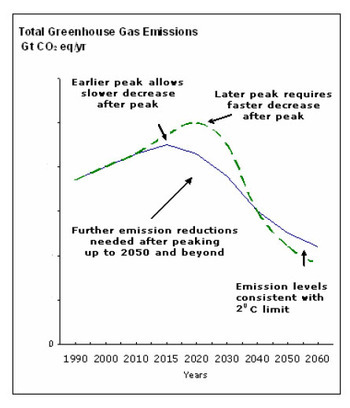 The experts (see notes to editors) suggest that annual global greenhouse gas emissions should not be larger than 40 to 48.3 Gigatonnes (Gt) of equivalent C02 in 2020 and should peak sometime between 2015 and 2021. 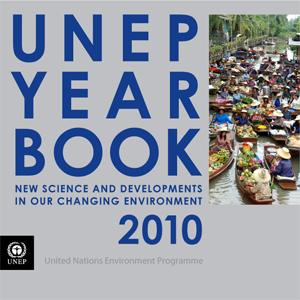 They also estimate that between 2020 and 2050, global emissions need to fall by between 48 per cent and 72 per cent, indicating that an ambition to cut greenhouse gases by around three per cent a year over that 30 year period is also needed. Such a path offers a 'medium' likelihood or at least a 50/50 chance of keeping a global temperature rise at below 2 degrees C, says the new report. "Figure 1. Two key points are illustrated here. First, there is a tradeoff between the timing of the peak in emissions and the rate of decrease in emissions afterwards ?The sooner and lower the peak, the slower the rate of decrease can be afterwards. 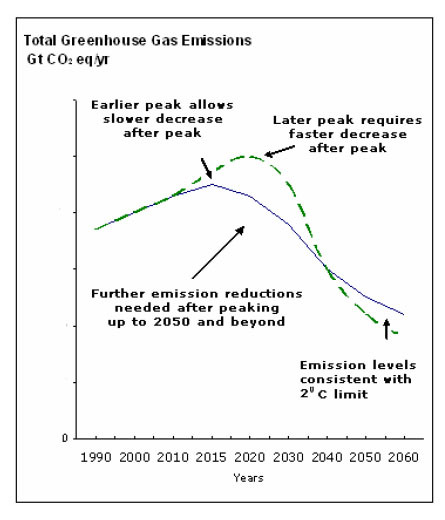 Conversely, the more the peak is delayed and the higher it is, the faster emissions must decline afterwards in order to stay within the temperature limit. Second, even if the emissions gap is closed in 2020, further emission reductions after 2020 are necessary if the aim is to stay within the two degree limit. It is therefore advisable to set international emission targets not only for 2020 but also for 2050 to be confident that cumulative emissions over the long run do not cause a greater than two degree increase in global temperature. "